Incheon Metro said on March the 2nd that it would be adding Chinese and Japanese announcements to the subway starting this month in order to make it easier for non-Koreans to use the subway. Last month Incheon Metro had added Chinese and Japanese announcements (in addition to the existing English ones) in the Songdo International City area of the subway and seven major stations. A spokesperson from the Incheon Metro said that the added languages were part of the city's preparations for its hosting of the 2014 Asian Games. 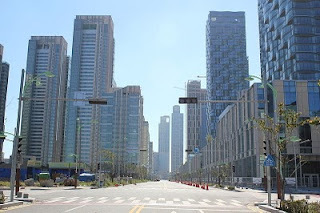 Songdo, by the way, is this - a planned international business district that still has not managed to live up to its name. Last month I remember seeing a feature on the news about how empty the buildings there are, complete with interviews with taxi drivers that have yet to see a single foreigner in the area. It's not done yet though so let's give it a few more years to see if they can pull it off.